The latest reports from the USA highlights that bats are being killed by wind turbines is great numbers. However with small adjustments to the revolution speed we can hugely reduce the number of deaths and cause very little reduction in energy output. The last report I saw from the UK was by RSPB and indicated that WT’s did not cause anything but minor mortality to bats. I don’t know which is right or wrong and how much the technology is different say from the States to European models. But its clear we do need to look out for our little friends and rather like Bees understand and rejoice in the work they do for us in reducing insect populations and their effects on crops. We at LGE would welcome more information and input from anyone or any source that might throw more light on this hugely important matter. 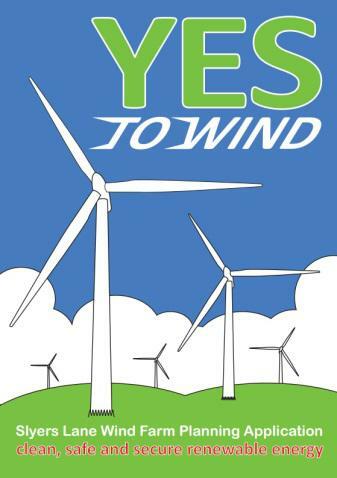 I recently attended a wind turbine planning determination in a crowded village hall when the planning committee (well 6 of the 11 members attended) decided the fate of an application for 4 large wind turbines. We all listened to officers of the council and AONB explain the landscape and heritage sensitivities (the turbines would be seen in the setting of listed buildings and the beautiful Dorset landscape) followed by numerous speakers against and for the application. 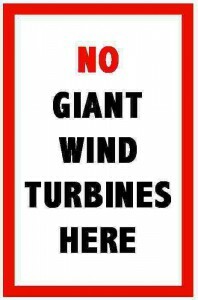 Those opposed to the application made the point that our landscape must be preserved, that the turbines would be seen from village houses and gardens and even that wind turbines damage people’s health. The CPRE claimed that renewable energy targets in Dorset had been exceeded so no new installations were needed. Each speaker received rapturous applause. I have witnessed a few campaigns to oppose wind turbine applications in Somerset and Dorset. There is usually assistance from outside organisations. Meetings, leaflets and doorstep petitions are arranged. The purpose – of course – is to raise anxiety levels. Misinformation is spread such as; bird and bat populations are put at risk; infra sound prevents people sleeping and gives them headaches; house prices will fall and tourists will stay away. Wind turbines are inefficient and generate hardly anything. Sometimes photographs that exaggerate the scale are published. In reality, the choice to approve or not – as the officers and members present acknowledged –is justified on the basis of a subjective view of landscape and visual aesthetics. About seven of us spoke up in favour of the application. It was explained that climate change is an issue that needs to be dealt with so urgently we need to move to 100% of our electricity from renewables ASAP, that wind turbines are the cheapest technology but that there are very sites suitable for their installation in Dorset. When I spoke, looking out onto the big audience of grey haired baby boomers while younger people were at work, I realised just where the divide in opinion lay. The majority of the audience – many retired to timeless Hardy’s Dorset – would not sacrifice their views from around the village to give the younger generation a better future. Yet just think what the generation before the baby boomers sacrificed in the 30s, 40s and 50s! Anyone wanting to live in Hardy’s Dorset should stop using electricity, swap their car for a horse and cart, live in a very small draughty house and campaign to take out pylons and large roads. If we walk backwards into the future, we will suffer because we can’t see where we are going. I spoke up for farmers. They may be sitting on land and property worth millions with large sums flowing through their business but their disposable income can be modest. They work very long hours as standard and consider themselves guardians of the land (and landscape) which they expect to pass on to their children rather than realize paper wealth. I was once told by a farmer – only half-jokingly – that I shouldn’t expect him to take my opinions on local matters seriously because my family had not been in Dorset since Saxon times. Despite that comment, farmers are usually quiet, self-effacing, not prone to voicing their opinions and actually can be intimidated. 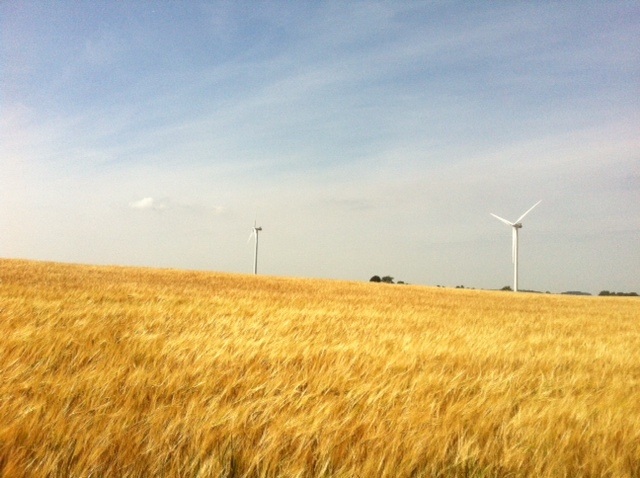 Wind turbines make sense to farmers because they give resource efficient future financial security. The opposing camp are very ably led by people some of which, have moved into the area to retire. They put high value on the landscape the farming community have created and look after, but look to the past rather than the constant change and planning for the future they may have experienced in their own working lives. The media are underestimating the connection between peoples voting intentions and their views on climate change. The Green surge is largely due to younger people with a strong sense of injustice against their generation. Baby boomers have had it good with their jetting around the world on holiday, big cars and houses by mortgaging their children’s and grandchildren’s futures (the deficit.) This put the carbon in the atmosphere that puts future generations in jeopardy. Big news from Spain, the launch of bladeless wind turbine’s indeed. 50% less cost, even better rates of energy generation they also have less impact on the landscape, people and wildlife. Wow with all those plus’s can we assume that all the Anti’s will now give up on their opposition and get fully behind the Countries move towards fossil free energy generation. The wind has been our friend since the beginning of time with transport, food production and even drying our clothes before tumble dryers were even invented. So lets embrace its force and use it for the common good. If you would like to comment on this or any other subject please go to our blog comment page or the comment section below this article. "We had published one of the first benchmarking research, focusing on the efficiencies of commercial wind turbines in the global market: https://ertekprojects.com/gurdal-ertek-publications/insights-into-the-efficiencies-of-on-shore-wind-turbines-a-data-centric-analysis/ Also, we recently published another research study, this time on wind turbine accidents news: http://ertekprojects.com/wind-turbine-accidents/ Please feel free to communicate with me regarding your feedback on these studies, Dr. Gurdal Ertek "
"Wind turbines and the industry have a great future. This is great news for the world, because wind energy is a leading source of renewable energy, and contributes greatly to earth’s sustainability. As a professor interested in the topic, and with some experience on the topic, In recent years, I have conducted and published unique research on the topic, together with my research partners. Here are the links to our research study on the efficiencies of commercial wind turbines: https://ertekprojects.com/gurdal-ertek-publications/insights-into-the-efficiencies-of-on-shore-wind-turbines-a-data-centric-analysis/ and, on wind turbine accidents: http://ertekprojects.com/wind-turbine-accidents/ Please share with me your thoughts, Dr. Gurdal Ertek "
I stood on a hill in the Eastern Algarve looking at the beautiful landscape towards Spain. It was too early for Spring Flowers but nevertheless the views were breathtaking. I could see a multitude of Wind Turbines glowing in the winter sunshine and all turning in the distance – were they in Spain or Portugal ? It didn’t matter- they were a part of the total experience. I knew at once that they must have been creating pure, clean energy and it felt good. No intrusion of the view just enhancing !! "Wind turbines are becoming more and more efficient thanks to scientific and technological advances. We had conducted one of the first benchmarking studies on efficiency of wind turbines in the global market: https://ertekprojects.com/gurdal-ertek-publications/insights-into-the-efficiencies-of-on-shore-wind-turbines-a-data-centric-analysis/ Also, we recently published another research study, this time on wind turbine accidents news: http://ertekprojects.com/wind-turbine-accidents/ Best Regards, Dr. Gurdal Ertek "
"I agree, wind turbines are aesthetically pleasing and they don’t take up much room compared to a solar farm producing the same amount of energy. I was on Hambledon Hill very recently and the solar farm really is an eye-saw which detracts from the typical English beauty of its surroundings. " "Dorset artist says yes to Wind Turbines they even enhance the landscape and are so important for our future on this planet "
West Dorset Pro Wind Group website now live! Find out what is happening with Blandford Hill Wind Farm at Winterbourne Whitechurch, West Dorset Wind Farm near Tolpuddle and Slyer’s Lane Wind Farm between Charminster, Charlton Down and Stinsford all of which have submitted planning applications. There is also information on how you can contact us and how you can help lend your support. 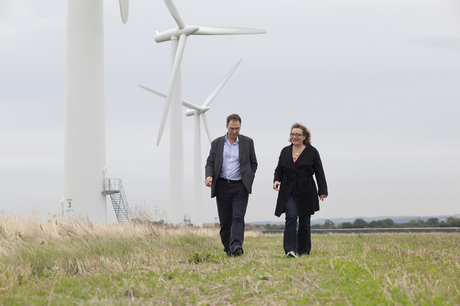 Parish Council Survey on Slyer’s Lane Wind Farm Charminster and Charlton Down residents only. 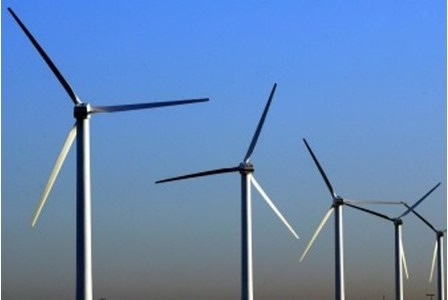 This article appeared in the Daily Telegraph – http://www.telegraph.co.uk/earth/energy/renewableenergy/11125908/Thousand-more-wind-turbines-than-UK-needs.html. Where do you start? It is total nonsense! What is worse is some of the total C**P in the comments after the article. The first point is that, on current planning application process times, all they are saying is that wind power might reach its share of the 2020 target in time although this actually seems unlikely as some applications take as much as 10 years to reach fruition. I suspect that other forms of renewables will be way behind target given the slower than expected technological development in things like wave power and the persistently high LCOE figures for offshore renewables and nuclear (far higher than the relatively low cost of onshore wind) which are likely to make it difficult to have such technologies take up their projected share of the burden without causing unsustainable price rises for the consumer. Secondly, and I keep stressing this and suggest that everyone else does so too, 2020 is not the end of the process! David Cameron himself recently stressed the importance of the 2050 target for 80% decarbonisation which is the only one that actually makes a difference when we consider the risks of run away climate change because the 2020 target of 15%, if it is achieved and then no more progress is made, will merely mildly delay the point at which we reach a significant tipping point and the driving force of climate change stops being human activity directly and starts being more related to factors such as the lack of albedo effect once the ice caps have gone or the mass evolution of methane from the oceans and melting tundra. If, and it is still a big if, we can build a bit more onshore wind than the 2020 targets suggest now it is a good thing in that it helps us have a better chance of making the 2050 target. In the comments following the article we get the same old rubbish about wind farms being too intermittent, they don’t save any carbon emissions because fossil fuel capacity is on spinning reserve, its all about subsidies for greedy land owners and developers. All of these are just lies. The variation in demand is far greater than the variation in wind power so the need for spinning reserves is going to be there regardless of whether we have wind power or not. Much of the reason why peaking and balancing generation (the spinning reserves) is so less efficient than baseload generation is because much of our peaking and balancing currently comes from low efficiency open cycle gas turbines (OCGT`s). This need not be the case in the future. Pumped hydro and electrochemical storage technologies both have the response characteristics to perform peaking and balancing. Efficient new generation combined cycle gas turbine (CCGT) plant is also much quicker to react than the older CCGT and they could be run more and more on Anaerobic Digester gas and hydrogen derived from surplus wind or other renewables. 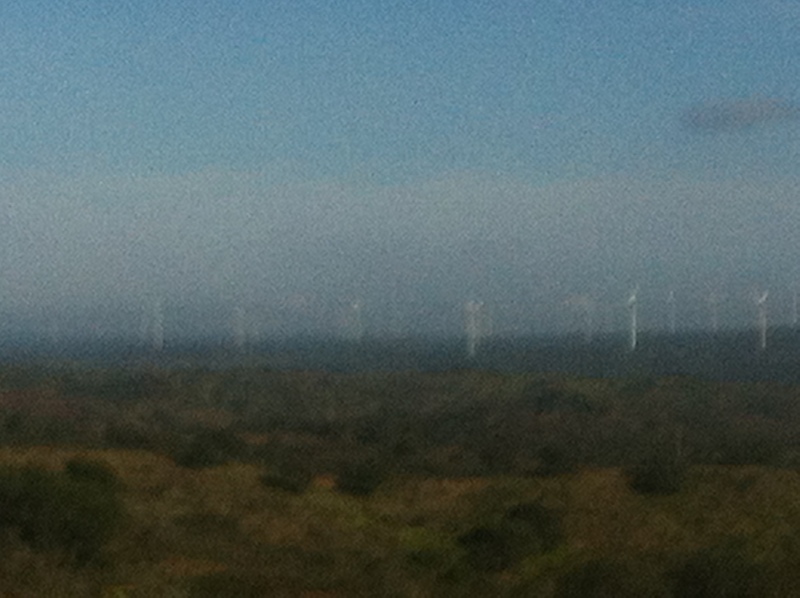 We need to get rid of the out of date OCGT technology not the wind turbines! Even with the old OCGTs causing minor issues the effect of renewables in general and wind in particular is now proven in the National Grid and DECC figures that show reductions in coal consumption and consequent CO2 reductions clearly linked to renewable generation so the positive effect of renewables isn’t even a theoretical effect in the future, it is already making a significant contribution despite the relatively low share of overall capacity – lesson learned build more of what is working not less! I heard an article on the radio recently that was very interesting. I have thought for some time that we are in the same position regarding climate change and renewable energy that we were in regarding lung cancer and smoking in the 1970s and 80s in that people with scientific knowledge (I won’t call them scientists because their lack of respect for scientific truth debars them from that title in my opinion) are being employed by those with huge financial interests in stopping the development of renewables to generate spurious but believable “evidence” against renewables. The radio piece I heard actually suggested that not only were the big fossil fuel firms using the same tactics as the tobacco firms they were actually employing the same people! "The new EU targets that the Govt has agreed may or may not be good news as far as reaching the ultimate targets of full decarbonisation but they certainly require a near doubling of the renewable energy contribution between 2020 and 2030. Given that the amount of renewables we will have by 2020 will have been put in place over several decades this will mean a scaling up of the rate of delivery of renewables. This means that any suggestions that we have enough are just stupid. " Cancel Hinkley Nuclear Power and make the possible Possible "
Anti- renewables campaigners have been making much of the suggestion that we have enough or nearly enough Renewable Energy capacity to meet the 2020 target in Dorset. I maintain that this is false on many levels. To show why I think it is untrue we have to look at what lies behind this sudden shift of tack. After all it is only very recently that these same antis were saying that Renewables are a waste of time because they hardly ever generate much electricity, could never make a real difference and are only about fat cat industrialists milking subsidies. Now they want to make out that the small amounts of renewable capacity we see around our county is enough to meet our targets. It is true that renewables nationally are making a significant impact. With continuing rapid investment and capacity building we might make our targets. Where is their data coming from? Some of the most comprehensive data they are using has recently been prepared by Dr Peacock of the Dorset CPRE. His data suggests that if 80% or more of the large scale field mounted PV projects in planning (including several in the most tentative early stages of planning) are approved and built before 2020 then we might reach the 2020 target as interpreted in the Dorset Renewable Energy Plan. Firstly there is a world of difference between having planning applications in the system and having enough renewable energy capacity on the ground so currently we do not have enough capacity to meet any targets and any anti who claims otherwise is either mistaken or lying. Secondly the list of planning applications includes some very large schemes and some on very sensitive land including one of 220 acres and one 100 acre site not only in the AONB but also on an SSSI. It would seem very unlikely that the CPRE or other groups who have opposed renewables applications in the past would support anywhere near the 80% of the capacity mentioned in Dr Peacock’s submission. I’m not entirely convinced that such schemes are the best way forward and would look to see some pretty convincing Environmental Impact Assessments before giving them my automatic support. Next is the all-important question of what the Dorset Renewable Energy Plan calls for. I have been critical of the plan since I first read it a couple of years ago. 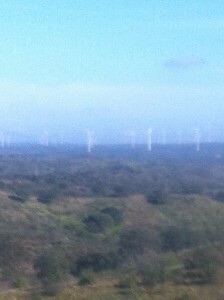 I do not believe that it goes anywhere near far enough in setting targets for renewable energy generation in Dorset. I went as far as to state my opinion at the time that is was more of a NIMBY’s charter than a plan for renewable energy! The way it is being used by anti-renewables groups has proved me right. What is wrong with it? It calls for Dorset to generate 7.5% of its primary energy excluding transport from renewable energy sources cited in Dorset by 2020. Not only is this only half of the 15% target set nationally for 2020 but the exclusion of transport makes it in effect even less than that. The authors of the report envisage the other 7.5% and all the corresponding savings in transport emissions to come from “national” measures. I interpret this as meaning “put it in someone else’s back yard” and would point to the antis’ attitude to the most important national measure in our area as evidence for this interpretation. The measure I refer to is Navitus Bay – the lowest impact scheme for Dorset possible who’s only downside is the same as all offshore schemes in that the cost of the electricity it produces is likely to be about the same as that of nuclear – ie fairly high. Even more important is the fact that the Dorset Renewable Energy Plan, like all the thinking of the antis, appears to regard 2020 as the end of the process. We have been hearing in the last few days about the climate marches and pressure on world leaders to set meaningful targets for carbon reduction not just for the next 6 years but for real progress towards proper sustainability and carbon neutrality by the middle of the century.2020 is only a way marker. If we exceed the target for that date, however it is calculated, then that is a good thing not a mistake. We are still taking the low hanging fruit. Any extra progress we make now will only help us keep up the momentum when things get harder in the next few decades. We certainly should not reject any projects just because we may or may not reach the 2020 target without them. In conclusion, Renewable energy technologies have proved their potential and are making a real impact but we still have a long way to go. Dorset is trailing badly compared with other counties and needs to get on with building as large a capacity of a mixed bag of renewable technologies as possible. Far from being especially unsuitable for renewable energy generation Dorset has excellent resources and limited pressures on space and demand so we should be doing better than other places not worse. "Its pretty frightening the influence that people have over process when they assume totally biased positions. Its quite possible 50% of the projects will fail at planning because of Nimbyism so then where is the Dorset Target ? " "Breaking News – apparently David Cameron is recognizing the need for 2050 targets “Cameron argued the UK is already playing its part in tackling global warming and is on track to cut its greenhouse gas emissions by 80 per cent by 2050 as defined by the Climate Change Act. He also stressed that the country had already slashed emissions since 1990 and was now mobilising record levels of investment in renewables and clean technology” Even if you factor in the Conservatives liking for nuclear, fracking gas and coal with CCS there is no way we can meet these targets without using the full range of available technologies including onshore renewables such as wind and solar in considerable quantities. If you don’t like the idea of any or all of nuclear, fracking gas or coal with CCS then we will need masses more renewables in Dorset and everywhere else. http://www.businessgreen.com/bg/news/2371769/cameron-warns-world-must-act-now-to-deliver-legally-binding-climate-treaty?utm_term=&utm_content=Cameron%20warns%20world%20must%20%22act%20now%22%20to%20deliver%20legally-binding%20climate%20treaty&utm_campaign=BG.Weekly_RL.EU.A.U&utm_medium=Email&utm_source=BG.DCM.Editors_Updates "
Windmills to grind our corn. and by many derided as something cold, mean and menacing. So now is the time to face up and give our thanks and to support the new technology that turns wind into energy and count our blessings. 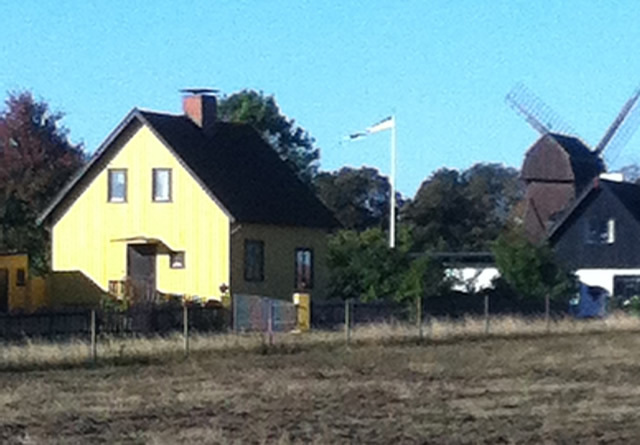 These photos are from my travels to Sweden where mills are at the heart of the community even in small hamlets – old mills used for food and new windmills (wind turbines) used for energy – showing that wind power can span the centuries to gather natural carbon-less wind. So let’s embrace wind turbines in some way and harness the power of the wind for everyone. "I am chair of a community project set up to create community-owned clean energy for the benefit of the community. We are convinced that wind power is a vital bridge, enabling us to act now to reduce carbon emissions with suitable urgency, but when new tidal power comes online in about 20 years, the wind turbines can be recycled and the land returned to nature. So we have applied for a small community-owned turbine. Please support it at Cornwall Council’s planning portal: http://www.cornwall.gov.uk/default.aspx?page=15927 – Please reference ‘PA13/06802 – Endurance turbine community owned’. For more information go to: http://www.FREEFowey.org.uk THANKS! " Wendy Pillar and Erik Blakeley from Energize Stur Valley, a local community group and partners of Dorset Energized, have outlined the benefits of wind power and why the controversial Silton turbines should be built, in a letter to The Blackmore Vale Magazine which was published today and highlighted as the top news item in thisisdorset.co.uk. "I believe all renewable energy installations have value. 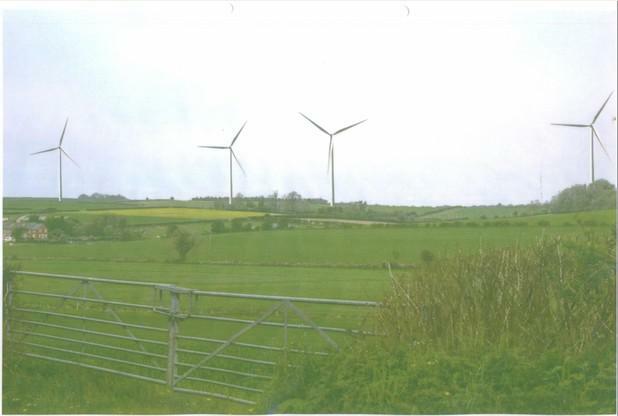 However, the Silton turbines were not universally accepted because the project had not grown from the local community and the very substantial financial rewards would not have been spread locally beyond the landowner. " "The result of the enquiry is disappointing as I believe it reflects a well-organised campaign more than the majority view. On-shore wind power remains a valuable part of the solution to the pending energy crisis, although projects are better organised from within the community. " "The appeal against the Silton wind turbine proposal has sadly been lost. All the more reason for Dorset to focus on REDUCING ENERGY DEMAND, so that the regrettably small proportion of renewable energy we are generating will grow in comparison. More investment in energy efficiency and more investment in encouraging behavioural change are needed in order to help make a smooth transition to a low carbon economy. " "Re: Wendy and Erik’s article. How naive to make statements about wind power fulfilling our energy needs when it only works when the wind blows and it must be at the within tight strength tolerances. Conventional fossil fuel stations are needed as back-up for other times. These are not attractive windmills but large industrial machines. They may take up a small amount of land on the surface but what about the tons of concrete below the ground needed to stabilise the tower. A half ton of CO2 per ton of concrete is generated. These schemes are being promoted by get rich venture capitalist who are interested in tax and bill payers money from the traded ROC’s(£2billion last year)These people are not concerned with Green issues or saving the environment. As usual they are init for the money. Do not be fooled! " Good Energy are calling on supporters to have your say on an important planning policy issue on our home turf and very close to us here in Dorset, which could affect the UK’s ability to achieve its renewable energy targets. The week before last, Wiltshire Council launched a public consultation on a controversial last-minute amendment to its Core Strategy which, if adopted, would effectively cut off a major route for developing renewable energy in Wiltshire. The amendment would stop wind farms being built by stipulating minimum separation distances between homes and wind turbines, ostensibly on health and safety grounds. It’s not just a local issue – Swindon is now discussing making a similar amendment to its Core Strategy, and Lincolnshire has already introduced restrictions. There is clearly a danger of a national precedent being set. We want to make sure that doesn’t happen. You don’t need to be a resident of Wiltshire to comment on the consultation – so please take a few moments to have your say. As Dorset Energized blog authors have pointed out before – supporters of onshore wind tend to be the silent majority, but now is the time to make your voice heard. The consultation ends on November 1st, so please take action quickly. I am posting as a member of Energise Stur Valley and following on from Vince’s blog post last week ‘Don’t be led by the small minority: the Anti Wind Turbine Brigade!’ about the Silton Wind Turbine Enquiry (you can read his post on http://www.letsgetenergized.co.uk/archives/2012/09/25/silton-enquiry). Energise Stur Valley (EVS) is a group of individuals favouring renewable energy generation installations. We believe we represent the majority of opinion in Dorset (as evidenced in all Dorset Citizen Panel questionnaire results that related to wind turbines). 1. 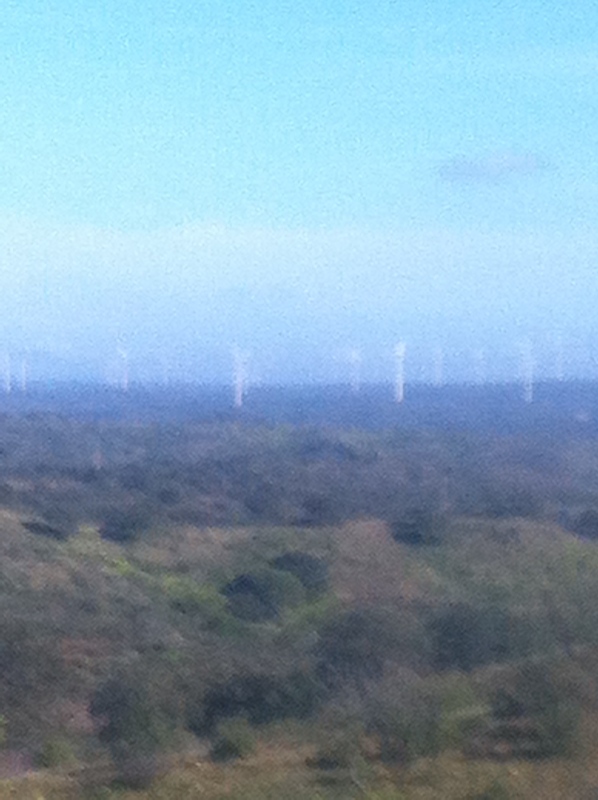 There is obviously polarisation of opinion about wind turbines in Dorset. Those with a history of activity in the local rural economy – sometimes going back generations – tend to understand the landscape as an active part of Dorset’s economy. Those with more recent interest in the Dorset landscape tend to have moved into the area to escape more densely populated areas of the country looking for their idealised rural idle. They are less likely to be working and are time rich. 2. 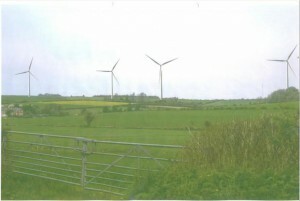 The representations against the application are motivated by concerns about visual impact, which is inevitably a big issue for those living closest to the proposed turbines but it must be remembered that they are definitely a minority within the district and – we would argue – even within the locality of the proposed wind turbines. The majority in favour of the application tend to be less motivated to voice their opinion and in some cases feel bullied to remain silent such is the robustness by which every positive comment is countered. 3. There is much misinformation being repeated by objectors to the application and reported in the local media. Statements made about the proposed turbines being inefficient, Ecotricity being financially unstable, the concrete to be used affecting the water table and emitting more CO2 than the turbines save are not correct. A more dispassionate analysis is required for this application. 4. With 4000 turbine now installed it is possible for wind generation to stand out from the statistical noise. Hard data available now shows the skeptics to be wrong. A new wind generation record of 4,131 megawatts (10.6% of UK consumption) was set on 14th September 2012. The average for September has been 6% of daily national electricity requirement. National Grid data analysis over the last three months shows a clear correlation between windiness, reduction in gas fired generation and actual CO2 savings. 5. Even with 4 times the current number of wind turbines expected by 2020, National Grid have stated they will be able to handle the new generation without major additional investment in dirty open cycle gas back-up. Responding to sudden surges in demand for electricity during the X Factor ad breaks is more difficult to deal with than the intermittency of wind. 6. All surrounding counties (Devon, Cornwall, Somerset and Wiltshire have multi MW turbines either already installed or with positive planning determinations. 7. The substantial wind resource in Dorset is not being utilised as described in the Dorset Renewable Energy Strategy. 8. Data from the CECC wind speed database shows the site to have viable wind speeds. Electrical loses through the grid will be low due to the close proximity of Gillingham which provides constant electrical demand. 9. 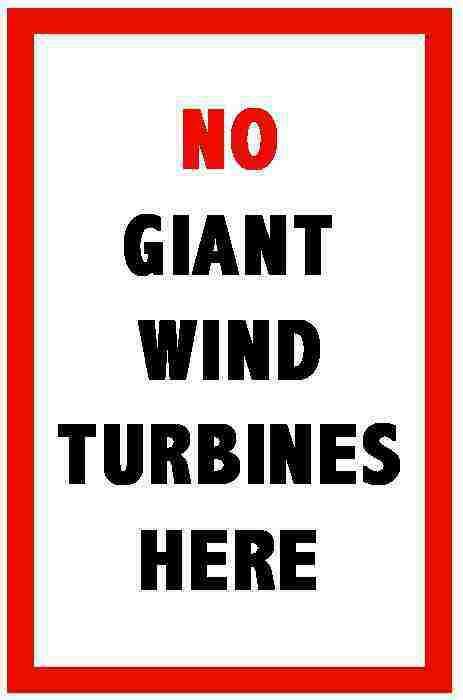 There are no wind turbines larger than 20 kW currently installed in Dorset. 10. We want to see large wind turbines in Dorset. Their elegance, beauty and positive aesthetic are matched only by a building such as Salisbury Cathedral. "For informed unbiased comment on the relationship between wind power and the back-up generation required, have a look at the view from DECC at http://www.e2bpulse.com/Articles/329507/E2B/Pulse/Blogs/Members_Blogs/DECC_Blog/The_viability_of.aspx "
"Will Keith Wheaton-Green be apologising to all the Dorset residents he has so roundly and inaccurately patronised with his insulting comments? And would he also acknowledge the simple fact that the ‘Citizen Panel’ to which he refers, consists of 3000 people aged 16 or over, only, out of a Dorset Resident population (according to Council data) of 710,000, indicating that the Panel represents only 0.42% of Dorset residents. Even the clearly biased Mr Wheaton-Green will realise that this is hardly representative of majority opinion on any subject. Richard Howman "
"On Countryfile last night, the featured investigation was into how the new planning rules make approval of new open cast coal mines more or less automatic, and nothing the local community or planning can do. There are about a dozen of these in the pipeline, frequently very close to villages or environmentally sensitive areas – makes windmills seem rather benign doesn’t it? We have to face the fact that energy is going to have to come from somewhere – nuclear (here, not out of sight, out of mind), coal or wind and solar. The choice is ours, for the time being at least, until the government feels the need to make the choice for us. "